And Mother Nature is full of surprises. For the past three years, none of my hardy camellias bloomed and some suffered dieback and death. 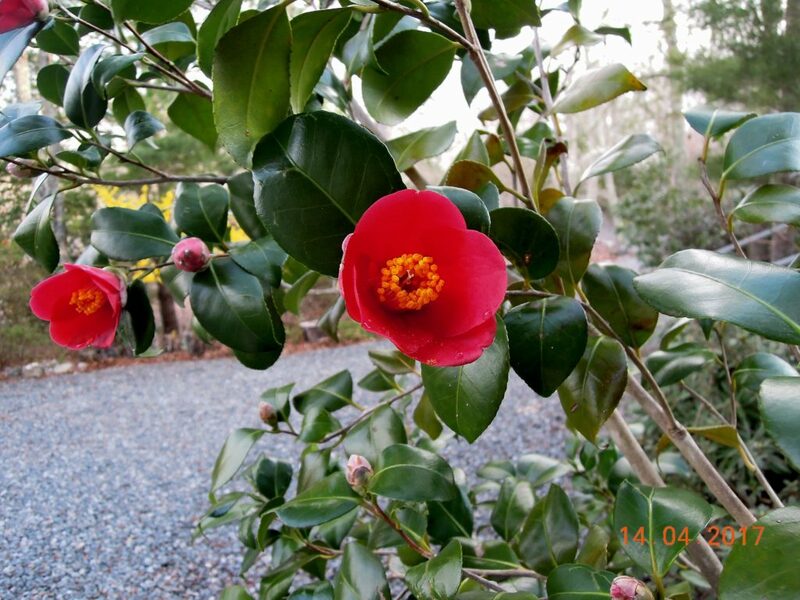 According to camellia guru, David Parks of Camellia Forest Nursery, the plants don’t appreciate dramatic shifts in weather — which is our new reality. So, reluctantly, I decided: No More Camellias! 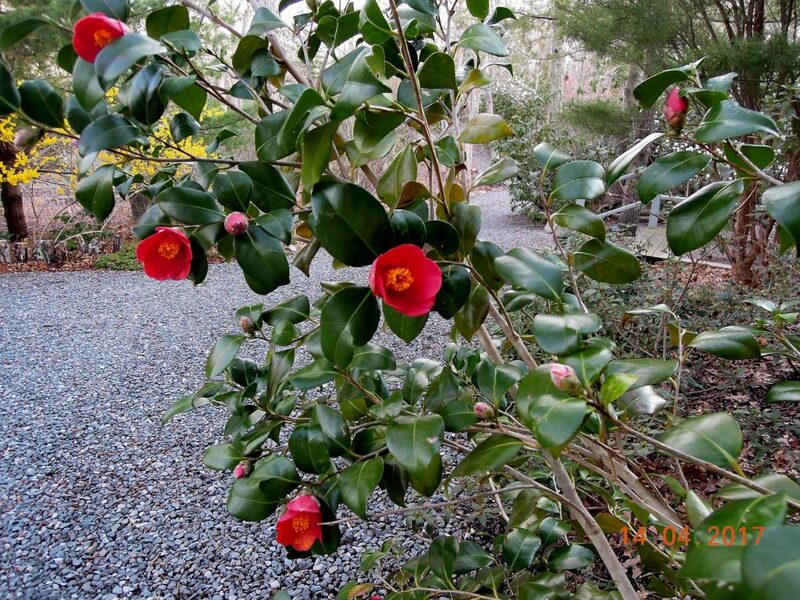 Imagine my amazement this Spring when I found Camellia japonica ‘Korean Fire’ — and others — full of flower buds. I don’t get it. Last winter wasn’t much different from the previous two. But I’m not complaining. Hey, when it comes to plants, it doesn’t take much to make me a believer. 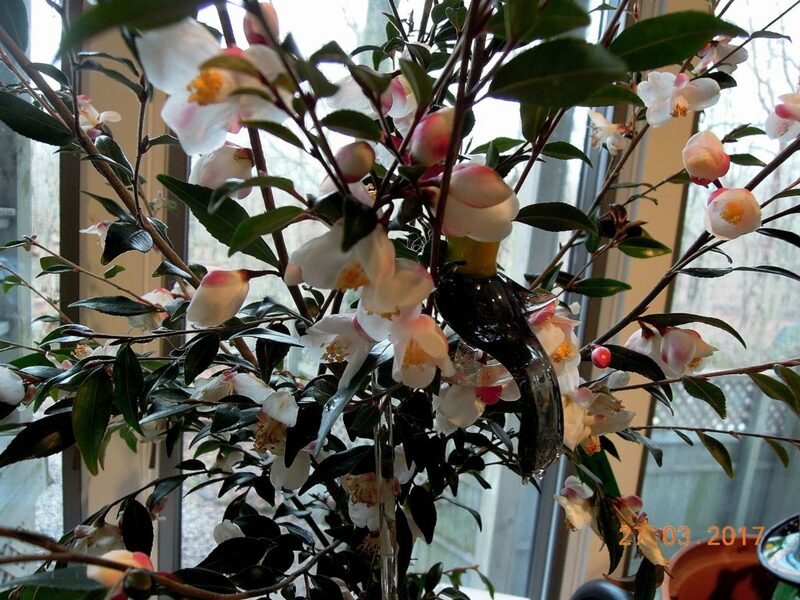 I fast ordered a new beauty, Camellia ‘Erina’, and re-upped with my local Camellia Group. Camellia ‘Korean Fire’, an award winning shrub, was raised from seeds collected in 1984 from wild plants growing on islands off the west coast of South Korea. 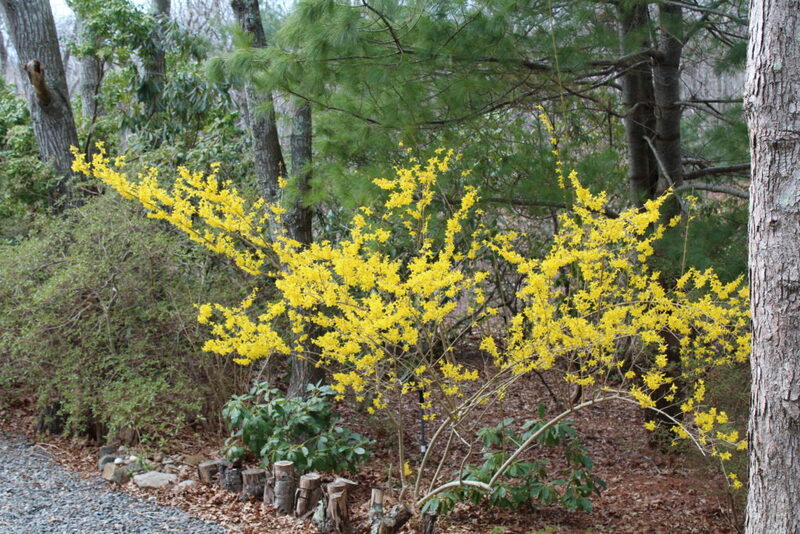 This area endures frigid, harsh winter weather, which clearly accounts for Korean Fire’s winter hardiness; while flowerless for three years, the shrub never sustained winter dieback. Moreover, before being released commercially, Korean Fire was subjected to decades of field trial evaluations for winter hardiness, leaf quality, vigor, etc., and surpassed all expectations. Photos below. Camellia ‘Erina’ is quite unusual.The plant has pink and white buds that produce a profusion of dainty white flowers with golden tufted centers. 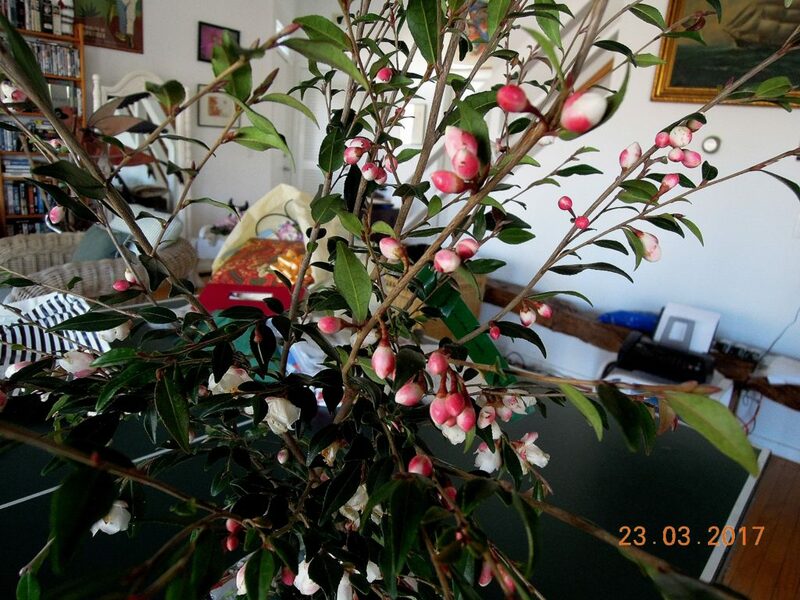 An elegant plant with perfect miniature camellias. I couldn’t resist. Photos below. Finally, despite Mother Nature’s assaults, the Fragrant Honeysuckle, Lonicera x purpusii ‘Winter Beauty,’ blooms reliably every year. 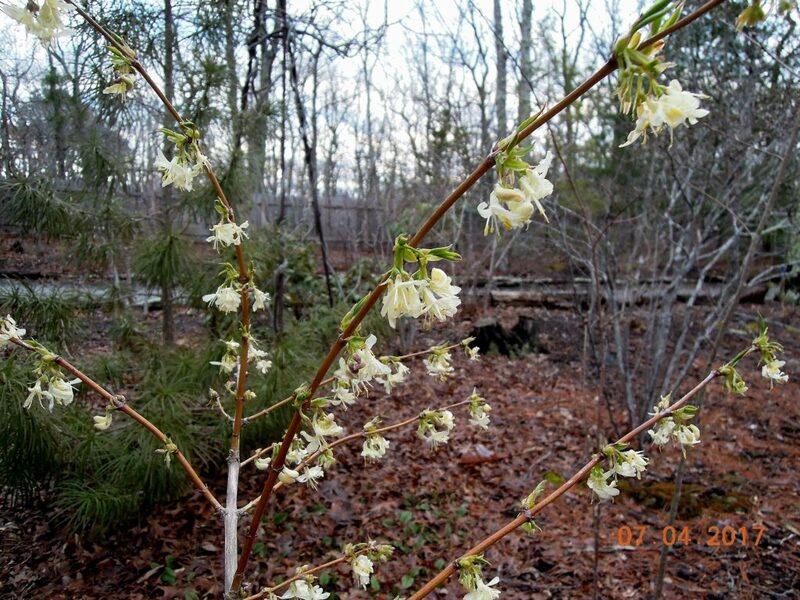 From late March until late April the shrub’s creamy-white flowers release intoxicating perfume that carries on the air. A most welcome sign of Spring. Photo below. I purchased the camellias Korean Fire and Erina, as well as the honeysuckle Winter Beauty, from Camellia Forest Nursery. You can click onto their website at LINKS. This entry was posted on April 15, 2017, in Flowering Shrubs, Flowering Trees, Fragrant Plants, Organic Gardening, Shade Gardening, The Fragrant Garden, Trees and Shrubs. Bookmark the permalink.